Thank you to everyone who attended our event this evening at UNO’s Community Engagement Center! innovative model for our state. collaborated with Terry and Jeff on the project and joined them for part of the program this evening. The challenges they encountered and the lessons learned resulted in a time-saving plan for anyone interested in proposing the same idea to other power districts. comments from audience members. Thank you to everyone who attended. Michael Shonka’s contact information is listed in Nebraskans for Solar’s Directory for anyone with additional questions. Terry Wittler may be reached at the following email address: terrywittler@gmail.com. 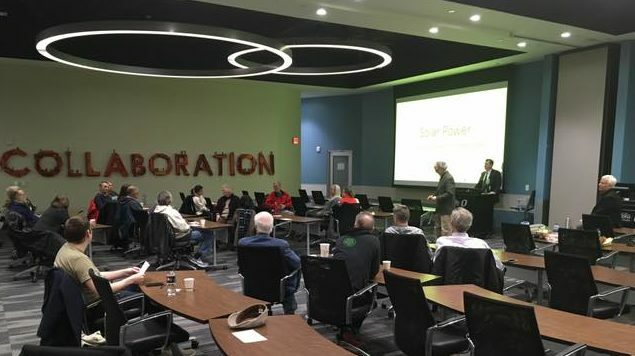 This entry was posted in Nebraska / Midwest News, Solar Energy Education and tagged Beach Solar LLC, Capitol Beach Community Association, Capitol Beach Community Solar Project, innovative community solar models, Jeff Buhrman, Lincoln Electric System, Michael Shonka, Terry Wittler on February 13, 2019 by Helen Deffenbacher.